As I have mentioned before, I am teaching a thermodynamics class at Anderson University. The first few lectures were mostly composed of review. It is important to do such a review, because some concepts are so critically important that I must be sure the students remember them and understand them well. Whenever possible, I like to do demonstrations to help the students visualize the concepts I am trying to get them to understand. That’s a puzzle Dr. Wile and you left it hanging! Why did it explode at the end instead of continuing to decrease until it was all burned up? I’m going to take a shot at it and guess that the flame, the point of the reaction, was initially all occurring outside of the can. 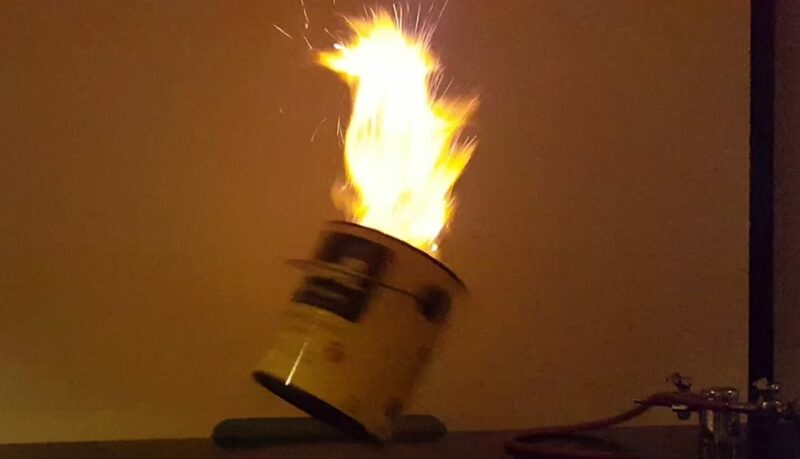 When it got down low, maybe the reaction point moved inside the can and was rapidly able to burn the remaining oxygen enriched methane environment inside the can? It’s actually not an enriched methane environment in the can. The methane is nearly all gone by the time the explosion occurs. You are correct that initially, the reaction is occurring outside of the can, and that limits the amount of mixing between the methane and oxygen. The heat of the flame causes the air to rise, which tends to push air outside the can away from the methane, once again, limiting how much methane and oxygen can mix. As the flame dies down, the air doesn’t rise as much, so the methane and oxygen can mix better above the can. Also, the can has been sucking air in from the hole on the side, so there is a lot of oxygen under the methane as well. Eventually, you reach a situation in which a thin layer of methane is sandwiched between two layers of oxygen. This provides ideal oxygen/methane mixing, which leads to rapid burning and thus an explosion. That’s really neat Dr. Wile. Thanks for posting it! Do you know how long that work top has been in service? I’m a regular reader of yours, and I work in the Resin Plant at Kewaunee Scientific Corporation where we make those kinds of epoxy resin solid surface tops. Given how shiny it is I would guess that it’s one of ours, since we have had the only shiny tops in the industry for some time. However, it looks like the edge is an older molded radius. We don’t make those anymore. If it’s older, I’m pleased with how well it’s lasted. We’re always looking for examples of how well our product is holding up. I am not sure exactly how old it is, but I know it is old. I did some videos there in 2002, and it wasn’t new back then.